What a whirlwind the last couple of weeks have been… Publication day was everything I wanted it to be and more. I got to spend the day with one of my fantastic publicists, Naomi, swanning around London book shops, signing copies and meeting kind and enthusiastic people. It all went a little haywire when my shoe broke and we had to make a slight detour, but literally nothing could rain on my parade. And all it meant was that we had to stop at a slightly more glam lunch location, Chiltern Firehouse, whilst my shoe was being mended by the cobbler down the road. What a chore. (There may have been champagne…) After all the signings it was straight over to Borough Market for the launch of another cookbook, the fabulous ‘Fresh India’ by Meera Sodha (check it out, her books are fantastic). Then finally over to Duck and Waffle for a celebratory dinner with my better half. Cocktails, stunning London skyline and a gorgeous sunset. If it all sounds like it was nauseatingly perfect, it was, and I take none if it for granted. I can’t believe Stirring Slowly is here, it is being sold in actual shops and more than anything people are cooking from it. Every picture of a recipe, every message puts me on a huge high. Thank you to all of you who have bought it and supported me along the way. I hope you like it. 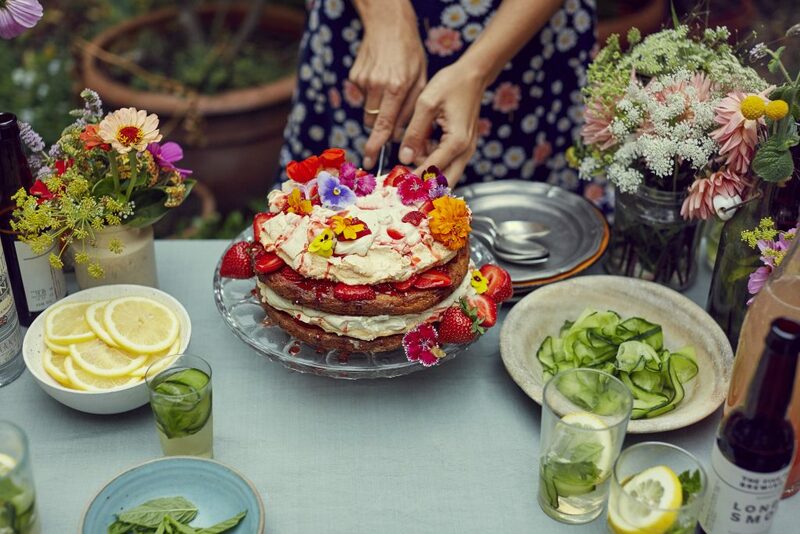 So, to celebrate, here is one of the cakes from the book, my ultimate summertime sweet. Especially fitting today with our mini heatwave, and Andy Murray winning Wimbledon. Strawberries all round! Preheat the oven to 180°C/gas 4. Grease two 20cm round cake tins and line with greaseproof paper. Cream the butter and 150g of sugar in a free-standing mixer until pale. Separate the eggs, and add the yolks to the mixer (keeping the whites to one side for later). Finely grate in the zest of the orange and lemon and beat. Fold in the flour and baking powder, followed by enough milk to give you a smooth, creamy batter. Evenly divide the batter between the tins and spread out. Don’t worry if it doesn’t look enough – it will be, I promise.Pop the tins into the oven and bake the cakes for 25 minutes, until golden and cooked through. Leave to cool in the tins for 5 minutes, then transfer to a rack and leave to cool completely. Reduce the oven temperature to 150°C/gas 2. In a clean bowl whisk the egg whites until soft peaks form, then slowly pour in 250g of caster sugar.Keep whisking for around 6 minutes, until the whites are glossy and stiff. Cut two pieces of greaseproof paper, big enough to line two baking sheets,and draw around the cake tins with a pen. Turn the sheets over and lay them on the baking sheets, sticking them down in the corners with a little meringue. Divide the meringue between the two circles (you should be able to see the outline faintly through the paper) and spread it out so it is just within the circles – the meringue will spread a little as it cooks. Smooth the top of one of the meringue discs and peak the other with the back of a spoon to give you a pointy texture – this will be the top. Bake for around 70 minutes, until cooked through but not too dry. Leave to cool on the baking sheets. While the meringues are cooling, make the fruit filling. Hull and chop 500g of the strawberries and place in a small pan with the Pimm’s and the remaining 90g of sugar. Bring to the boil, then reduce the heat a little and leave to bubble away for 8–10 minutes until you have a sticky strawberry Pimm’s compote. Leave to cool. Hull, quarter and slice the remaining 200g strawberries. When you are ready to layer your cakes, whisk the cream and vanilla seeds until soft peaks form, scrape in the vanilla seeds, and fold in the yoghurt. Place one of the sponges on a board or cake stand and brush with a spoonful of Pimm’s. Drizzle over half the strawberry compote and top with the un-peaked meringue. Spoon over most of the vanilla cream and most of the sliced strawberries. Top with the second sponge, brush with another spoonful of Pimm’s and most of the remaining compote, and add the final peaked meringue layer. 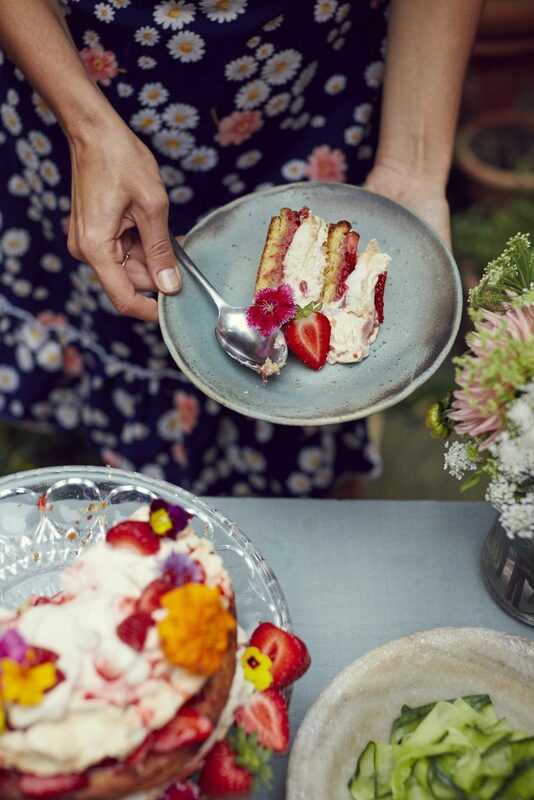 Top with a few dollops of the cream mixture, a drizzle of strawberry compote and the remaining sliced strawberries. Sieve over a little icing sugar and decorate with mint leaves and edible flowers, if you like. This looks lovely! Do you assemble just before serving or does it benefit from having time to meld? Thank you! I would assemble relatively close to serving. I probably wouldn’t leave it for too long? An house or so before max.